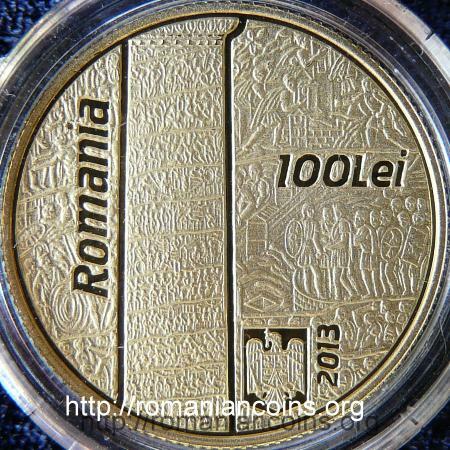 Obverse: ROMANIA, face value 100 LEI, coat of arms of Romania, year 2013, the upper part of the Column, on the background several scenes from this zone of the monument Reverse: silhouette of the Column, a detail with the votive inscription (placed vertically), a image of the lower part of the Column, on the background an image representing the lower part of the monument, inscription "Columna lui Traian" meaning "Trajan's Column"
Trajan's Column is also represented on the 1000 lei 2001 gold coin dedicated to the beginning of the first Dacian-Roman war. 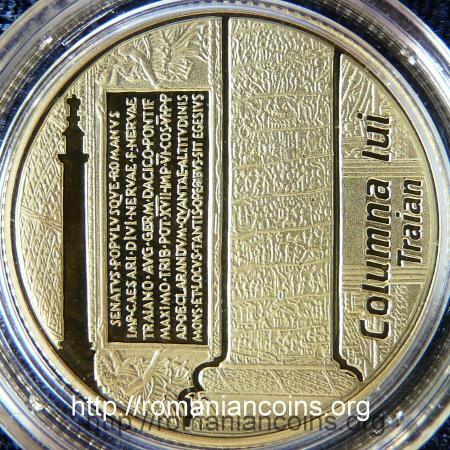 Trajan's Column was inaugurated in 113 AD, on 12th of May. The Column was placed in Trajan's Forum and was a new kind of monument, having three goals: to commemorate the victories in both wars with the Dacians, to indicate the height of the hill excavated in order to free up space for the tall building (almost 40 meters!) and to serve as mausoleum for the emperor and his wife. The urn with the ash of Trajan was placed inside the base of the column in 117 AD. The column is made from Carrara marble and Parian marbe. The pillar is made of 19 drums on which 155 scenes from the two Dacian-Roman wars were carved. Over 2500 characters appear on the column. Atop the column a bronze eagle was placed, replaced by Roman emperor Hadrian with a statue of Trajan. In 1557 AD atop the column a statue of Saint Peter was placed. The votive inscription can be translated (approximately) by: The Senate and the Roman People (dedicate this monument) to Imperator Caesar, son of divine Nerva, Nerva Trajan Augustus Germanicus Dacicus, to the great priest, having the power of the tribunate for the 17th time, acclaimed as imperator six times, who served as consul for sixth times, to the Father of the Fatherland, for marking the height of the hill and the place that was cut for freeing the space for such construction , . The inscription on the coin does not reproduce the dedicatory inscription as it looks today, when the slab [slate?] is chipped. Letters inside the square brackets TAN[TIS OPE]RIBVS are missing. More than that, the last word is written (on the coin) with a mistake, EGESIVS instead of EGESTVS. The inscription does not refer to the specific place where the Column is placed (the archaeologists realized that below the Column lies an old Roman road), but to the northern zone of the Trajan's Forum, the part that was excavated for leveling the forum .